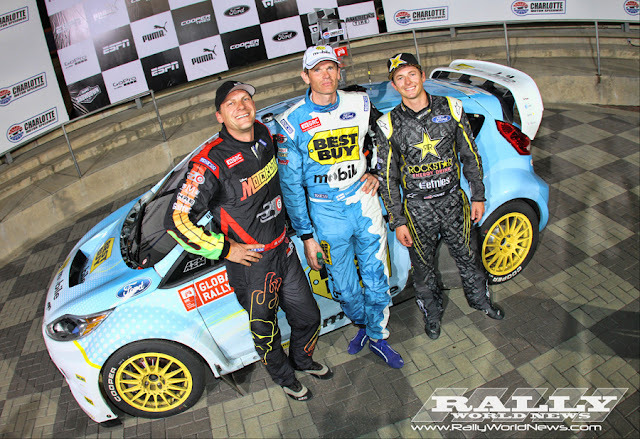 Best Buy RallyCross Team Driver, Marcus Grönholm [center] celebrates in victory lane at Charlotte MotorSpeedway, Grönholm is joined by Rockstar Energy Driver Tanner Foust [right] and Stéphane Verdier in the Disney XD sponsored Hyundai Veloster. 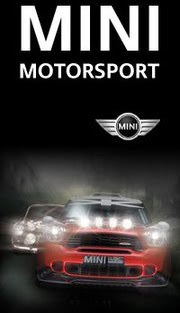 “Yes, of course, really pleased for the Best Buy Racing RallyCross Team today, this is what we came here to do. 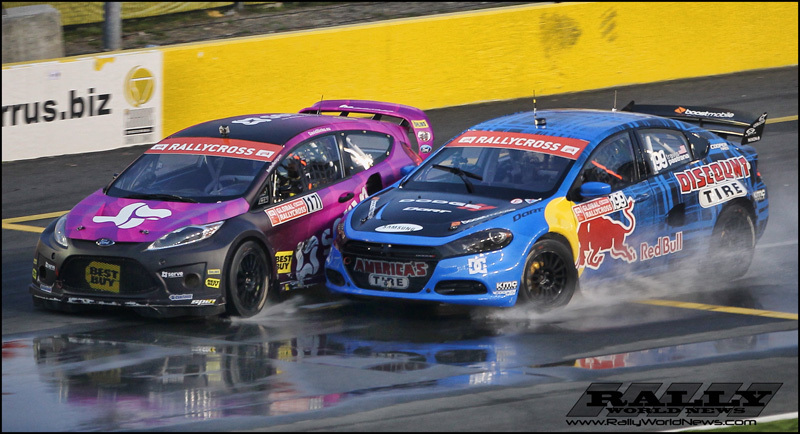 It was a pretty exciting conclusion to the weekend, as since Friday you have been used to fighting maybe three other cars at a time in the heats, then suddenly there are ten cars on track which really changes everything. With so many cars, staying out of trouble is really important and I got a big push from behind at one stage, I dropped quite a bit, but managed to get it all together and it was okay. Right now it is about enjoying the moment, but pretty soon we’ll start taking a look at Texas which isn’t so long away,” said Marcus. 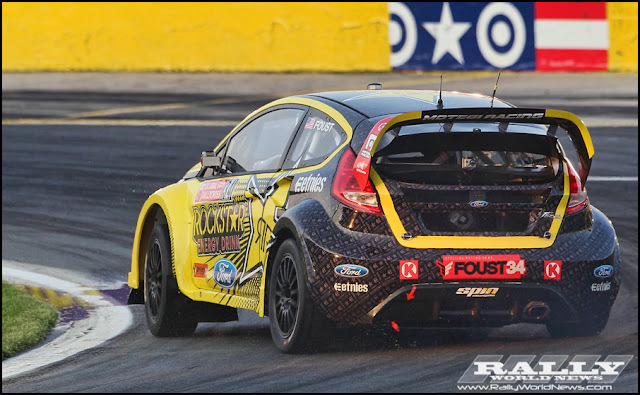 Despite his best efforts and crowd pleasing drifts Rockstar Energy driver Tanner Foust had no answer for the speed or clean driving lines of Marcus Grönholm, Tanner will need to tweak his lines a little for Texas if he hopes to tame the Flying Finn. Subaru also had a challenging opening round of the 2012 GRC, Dave Mirra who made it to the A final was taken out by an over aggressive Toomas Heikkinen. 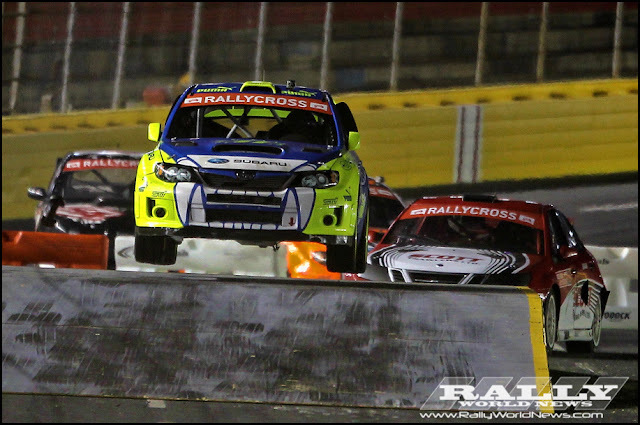 Buky Lasek showed remarkable form despite a slightly lesser spec’ed Subaru for this his first RallyCross. Sverre Isachsen who was driving the development car for Subaru, put in a stellar run in the heats before he was sidelined with Mechanical issues. 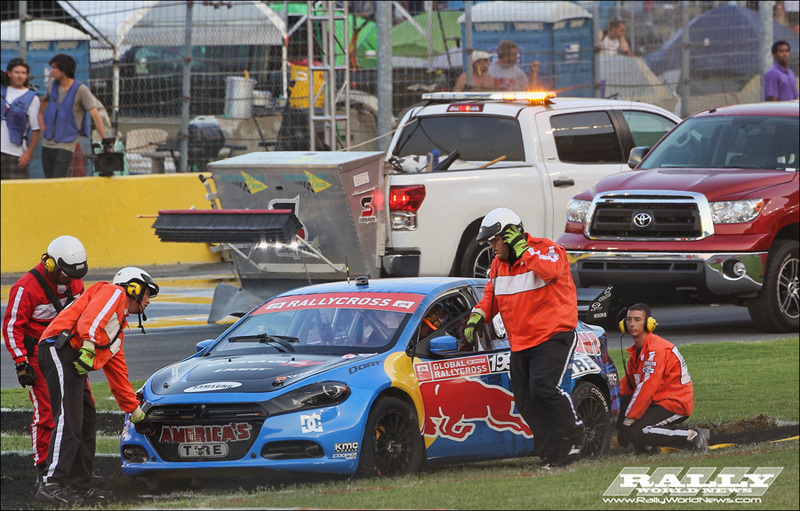 Despite retiring in the infield during the heats, Travis Pastrana in the newly developed Mountune powered Dodge Dart, showed the potential for things to come. Unfortunately Pastrana would suffer the same fate as Mirra as he was taken out in the final by Toomas Heikkinen. Travis Pastrana would also lock horns with Best Buy team driver David Binks, Pastrana would come out on top in this battle and go on to win the heat. Ken Blocks weekend did not quite go as planned, Block would lose the hole shot to Marcus in the opening heat and was in hot pursuit of the Flying Finn when he lost control of his Fiesta and nailed the wall. With damaged suspension Block pushed on but unfortunately he would then take out several water barriers before ending his run. Despite the best efforts of the Monster World Rally Team mechanics the Fiesta was not competitive in the last chance qualifier. Olsbergs /BlueBeam driver Toomas Heikkinen has quickly been branded the tough guy of the GRC; the young Finnish driver used his Ford Fiesta to sideline several top drivers on his way to third overall in the A-final. 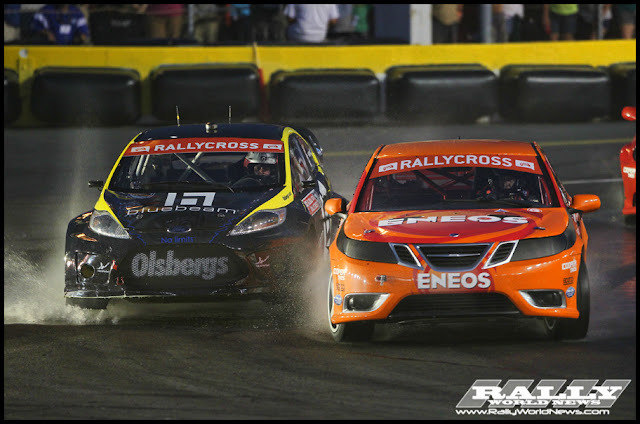 But the celebration was short lived as race officials black flagged Heikkinen for his aggressive driving. RMR team owner and driver Rhys Millen, who just signed a deal for the 2012 GRC season with Hyundai, definitely struggled to stay with the leaders. This is only the second year of competition for the Veloster and development is ongoing. 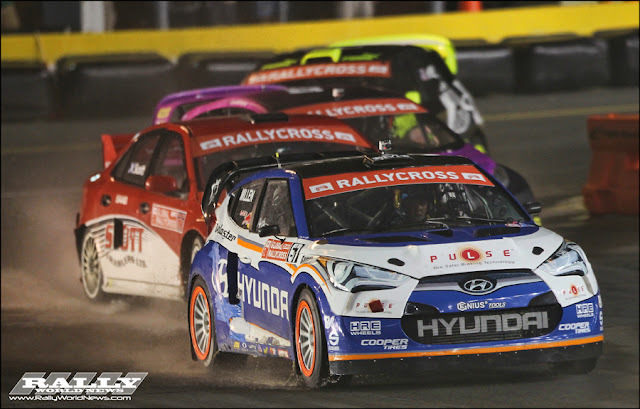 Despite Millen’s disappointment, his new teammate Stéphane Verdier in the Disney XD sponsored Hyundai Veloster would take the first podium for team in 2012 GRC.